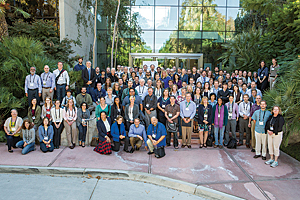 This year's event, the first of what is expected to be many ocean GIS conferences, showcased the multitude of ways the ocean community uses GIS to better understand and protect the ocean. Speakers at the conference emphasized the importance of enlisting the public's support in saving the world's oceans from the adverse impacts of human activity. 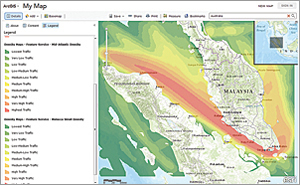 The event also gave Esri an opportunity to unveil new tools and enhancements to existing tools for handling multidimensional data. 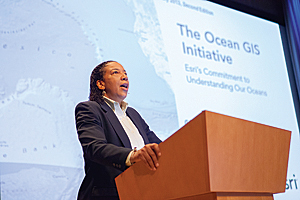 The summit was one of the first steps outlined in the Esri Oceans Initiative. Announced in 2012, it is an organization-wide effort to enhance Esri's capabilities to support GIS in both coastal and open ocean applications. 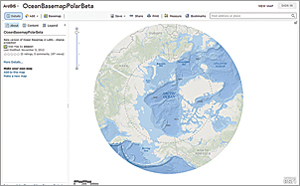 Esri has been involved in ocean conservation efforts since it first developed a marine spill analysis system in 1989. 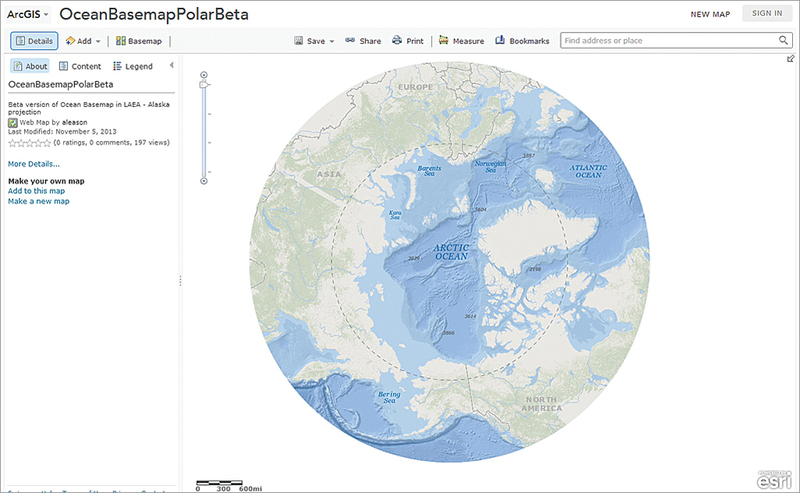 Efforts in this area continued with digital nautical charting projects with National Imagery and Mapping Agency (NIMA) [former name of the US National Geospatial-Intelligence Agency] and hydro information systems for Finland and Sweden. This work highlighted the need for handling more than two dimensions and resulted in the development of a data model for the marine environment. 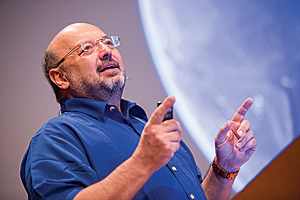 At the beginning of his address, Understanding Precedes Action, Gallo displayed an image of the earth as seen from space. It emphasized one of the challenges facing the ocean community: the misconception that "since we can see it all we know it all." The reality is that only a small percentage of the ocean has been studied. But even that limited exploration has revealed the ocean as a place of vast diversity, esoteric creatures, and geological features that dwarf terrestrial mountains and valleys. "Oceanography, to me, has always had these two parts. There is the excitement of exploration and discovery," said Gallo. "The other part is the importance of understanding it for the sake of the planet." Gallo has been using GIS as a tool for increasing his understanding since the 1980s when he traded his colored pencils in for ARC/INFO when drawing bathymetry contours. In the panel discussion that followed Gallo's keynote, Sylvia Earle reenforced Gallo's message that "protecting the blue part of the planet that keeps us alive" should be our first priority. Earle is a renowned oceanographer, author, and National Geographic explorer-in-residence. She was joined by Dr. Jerry Schubel, president and CEO of the Aquarium of the Pacific; David McKinnie, senior adviser for the National Oceanic and Atmospheric Administration (NOAA) Ocean Exploration Research; Gallo; and Wright. Schubel talked about the importance of getting "the public interested in, commited to, and caring about the ocean. You're all involved with data but the public and the policy makers don't want data," he said. "They want information. 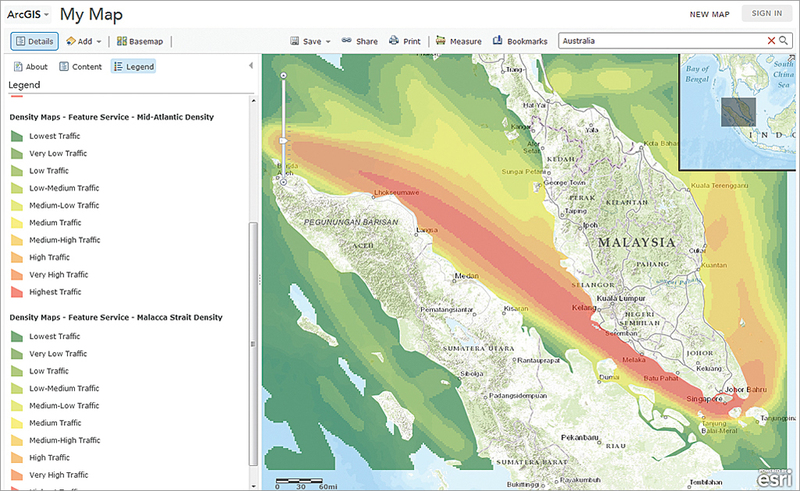 Data has to be converted into information, and that is one of the powerful things that GIS can do." 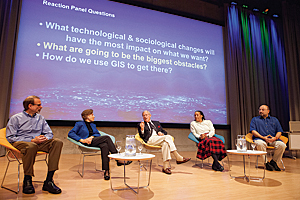 GIS aids collaboration and helps the ocean community tell powerful stories to the public. Schubel's Aquarium of the Pacific has effectively used story maps to translate science to the public. The app lets her obtain data in a usable format from a previously untapped source: companies that offer whale watching tours. 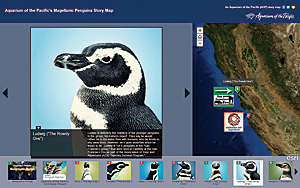 The app uses the device's GPS capabilites to supply location information, user accounts qualify who is submitting the data, and drop-down selections in the interface speed the input of species and activity information. A photo can also be included. Observations are uploaded by syncing to an online geodatabase. Existing GIS tools have also been enhanced with the capabilities requested at last year's Ocean Summit. Mosaic dataset functionality has been expanded to allow the storage of netCDF data so that it can be temporally and spatially aggregated. With the feedback from this year's conference, Esri will continue moving the Esri Oceans Initiative forward and developing the GIS tools and data that enable the ocean community to better understand and work in the complex marine environment. GIS can be especially valuable in capturing the public's interest in the fate of the ocean by delivering scientific information as maps that make a compelling case for changing human behavior. Moving from "what is"—limited knowledge of the ocean and abusive practices toward it—to a "what could be" future of greater understanding and widely held appreciation of the critical role of the ocean is a challenging goal. In his closing remarks, Esri ocean solutions manager Drew Stephens proposed enlisting the help of members of the ports community, offshore energy and shipping industries, and atmospheric research field who could provide additional information and insights. The situation is urgent, and the task is great. As Gallo noted, quoting Cameron, "The oceans are changing faster than we can understand them."